Welcome to the Dog Flea & Tick Collar superstore! Is there anything more frustrating than a dog covered with fleas? They irritate your pet, get on you and wreak major havoc throughout your house. They can even breed and multiply into the carpet and when that happens, you can have a real problem. 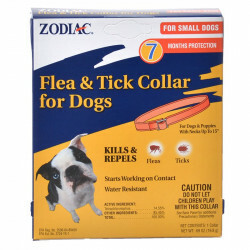 At petmountain.com, we have the discount flea and tick treatments that will work a miracle on your pets. While others may claim to have the best products, we guarantee it. 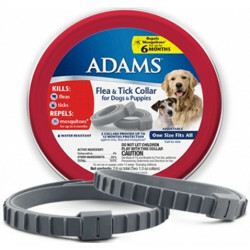 Pet Mountain's Dog Flea & Tick Collar store features top quality products from the most trusted names in flea & tick care and prevention for pets, including Adams, Zodiac, and Sulfodene. 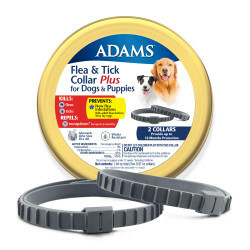 Our low price leader, Adams Plus Flea & Tick Collar for Large Dogs provides quick knockdown and residual control of fleas and ticks. This safe collar keeps killing fleas, flea larvae, flea eggs, and ticks for up to 5 months, and continues working even when wet! 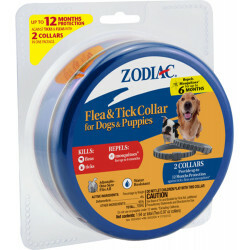 If you're looking for a great deal, our Zodiac 5-Month Flea and Tick Collar is fast acting relief from your pet's fleas. 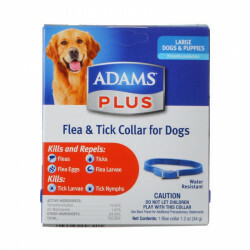 It continues killing fleas & ticks, including those carrying Lyme disease, for up to 5 months! This collar provides continuous action even when wet. 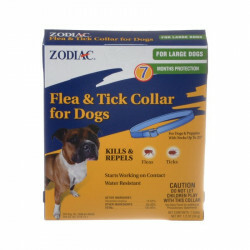 Our discounted Sulfodene Scratchex Flea & Tick Collar for Dogs kills fleas and ticks, including ticks that may carry Lyme disease. Protection against fleas and ticks is achieved within a few days, and this collar will provide continuous protection for up to 5 months. 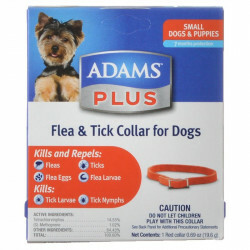 Simply replace this collar every 5 months to help prevent flea infestations on your pet and in your home. It works from head to tail, even when wet.